"Shrimp Boat on Break" 9" x 12"
I have fallen in love with painting Shrimp Boats! They have so many cool angles. I love the weathered paint jobs, but painting the rigging is the funnest part. I have more of these on their way. Amazing colors on the hull! Nice work. Thank you Michael for your comments and for following my Blog. I am putting this painting in a gallery show coming up in April. 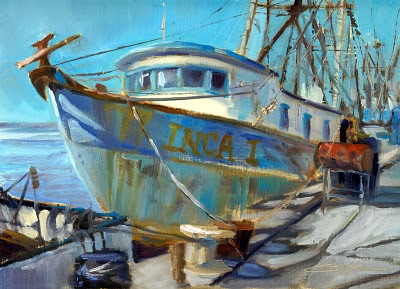 I painted it in Port Aransas, Tx area with a large group of other painters. It's one of my personal favorites.